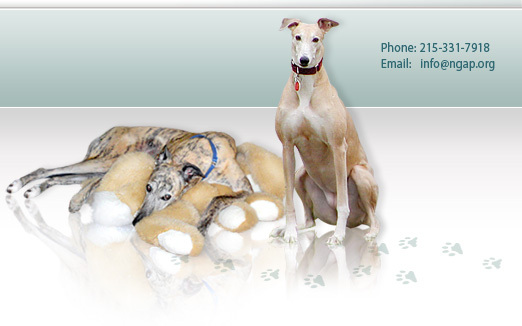 On September 19, 2012, we had the opportunity to a do a necropsy on a 13-year-old greyhound euthanized for a spinal-related issue. The necropsies presently performed at NGAP are for the purpose of determining how many of our greyhounds have internal organ issues that go undiagnosed. This particular dog afforded us the opportunity to look at normal organs that were not specifically compromised by a pre-existing health condition. 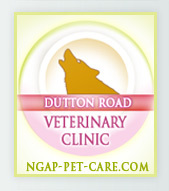 It is not uncommon to open a dog's body cavity and have blood running out. This was not the case with this dog. 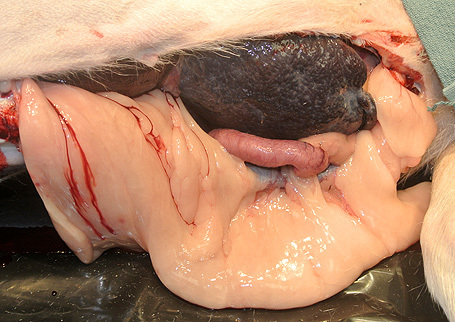 After the initial incision there was a layer of fat, shown in the photo below. The first organ encountered was the spleen. It was good in color with no obvious lesions and of an appropriate size for a dog his age. The net weight was 1.1lbs. We have removed spleens from Greyhounds with significant spleen issues that weigh from 5lbs to 9+lbs - literally gigantic masses obstructing body function! 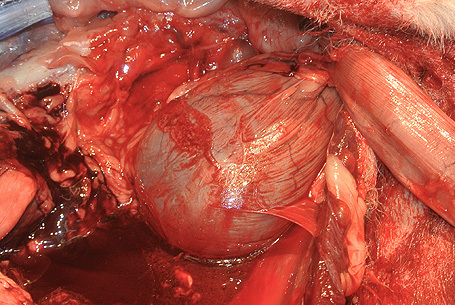 Above: The spleen on the top is a healthy spleen. 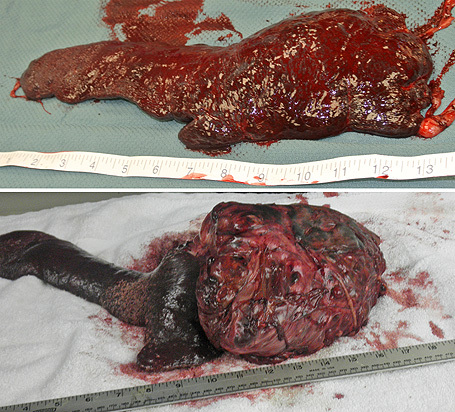 The spleen on the bottom had a cancerous growth attached that was the size of a human head and weighed almost 8 lbs. The kidneys were normal in size and color and appeared healthy. Above: Healthy kidneys on the left. Diseased kidneys on the right. The bladder was full, the appropriate color, and the dog would urinate when the bladder was squeezed. The liver was normal in color and size. Above: The liver on the left is a healthy liver. 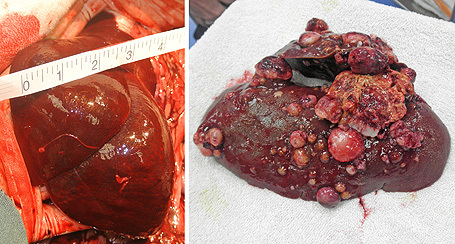 The liver on the right had cancerous growths. 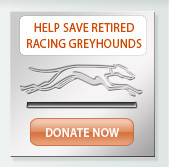 The heart was probably smaller than all of the previous greyhounds that we have examined. There was no evidence of heart murmur. 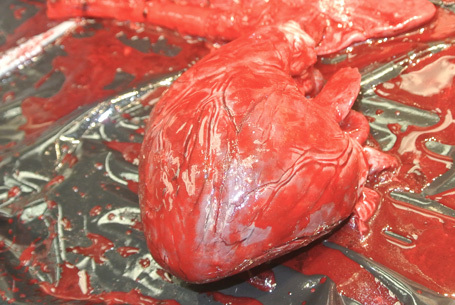 We believe that these photos show remarkably normal organs and we thank the adopter for permitting us to use their deceased greyhound for this exercise in learning.